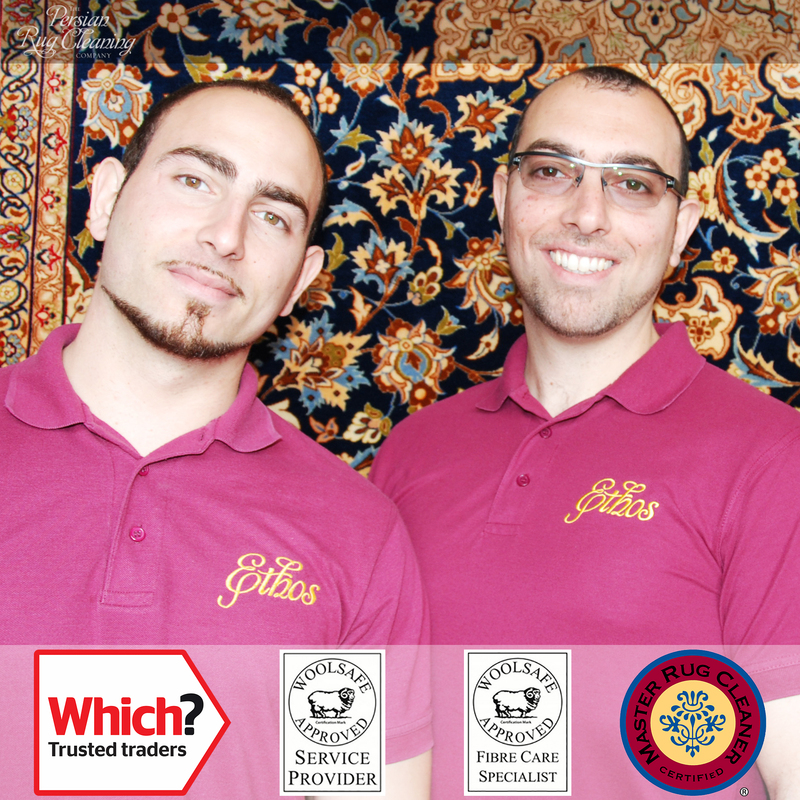 Our entire working lives have been devoted to the carpet and fabric care industry, with specific emphasis being placed on specialist rug cleaning and repair of all types of Persian and oriental rugs. We proudly display our qualifications, industry memberships, achievements and certifications. We keep all our rug and fabric care qualifications up to date and available for inspection. Read more about us here. Although there are many companies now offering the service rug cleaning London, and indeed throughout the UK, there are very few of us that have the knowledge, experience and premises to be able to carry out the job with efficacy. Below are details of two very different rugs we washed for clients both in Notting Hill w11. We used very different approaches when cleaning them. These case studies illustrate that not all rugs are cleaned the same way. 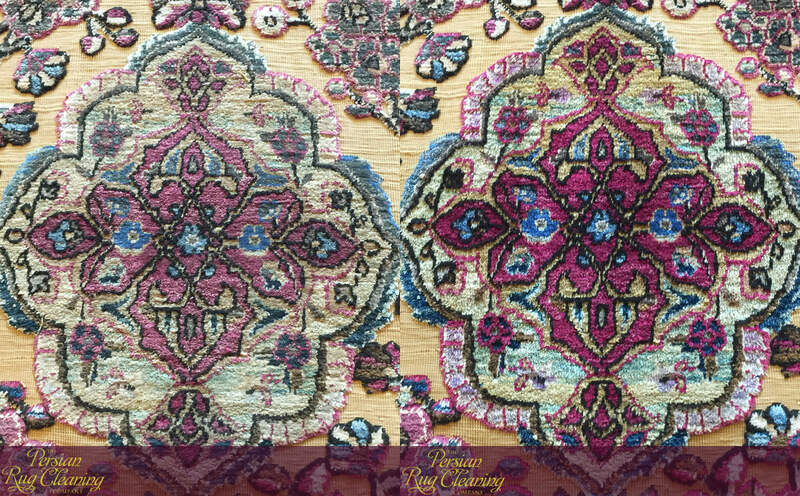 We chose the Isfahan rug in the main image above to demonstrate the results that are possible when washing a hand knotted rug even when it is very old and worn. It belongs to a client of ours in Notting Hill, W11 who wanted it revived because the colours were looking tired and faded. This is common on rugs that are very worn because as the white foundation is exposed it gets grey with years of trodden-in soil. The key to achieving good results when washing a rug like this is to soak it for an extended period of time in a cold neutral woolsafe® detergent with regular agitation. This allows the soil to slowly emulsify so that it can be rinsed out of the fibres thoroughly. Once the emulsified soil is then flushed out of the rug using high pressure cold water the results above are realised. The glorious red and aqua green vegetable dyes shine. Our client was so delighted with the results that she decided to display it on the wall of her entrance hallway instead. 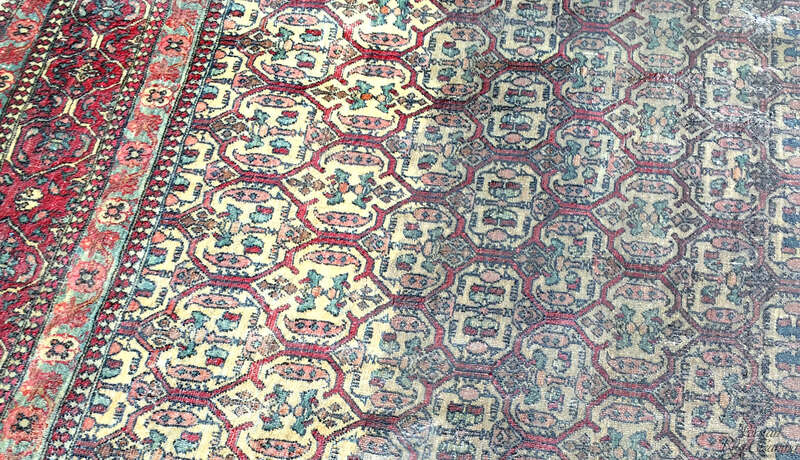 A 100% silk Kashan rug before and after dusting. We professionally hand dusted this rug to remove the dry soil. The image on the right shows the result. This rug hasn’t even been washed yet. This Kashan rug belongs to another client of ours just a few roads away from the previous client in Notting Hill. This rug however required a completely different approach to cleaning. The issue here was that the silk foundation was brittle with dry rot and the silk pile was saturated with fine soil. This meant that mechanical dry soil removal was out of the question because the foundation would break. Instead, we used a silk carding brush and a vacuum with a very soft brush head attachment to slowly remove the soil (called the dusting process) by hand. This was a slow and painstaking (but necessary) method of dusting which allowed us to then wash the rug gently by hand without fear of dry soil re-wicking to the surface when it had dried. This rug was also displayed on a wall when returned to the client. So to summarise, both of the rugs in the case studies above are Iranian and hand knotted. However we had to study each rug to determine what method to utilise and focus on in order to achieve good results without causing any damage. As shown in the case studies above every rug is cleaned in a unique way although each of the steps below will always be carried out in one form or another. Each step will be adapted depending on the rug being cleaned by either using a hand or mechanical method, adjusting soaking and rinsing times, drying methods and many other procedures. Every hand knotted rug is as unique as a fingerprint. Whether it is wool or silk, chemical or natural dyed, bought in a bazaar or a department store. This means that the potential for a unique set of challenges or issues that can arise from the rug cleaning process is always present. 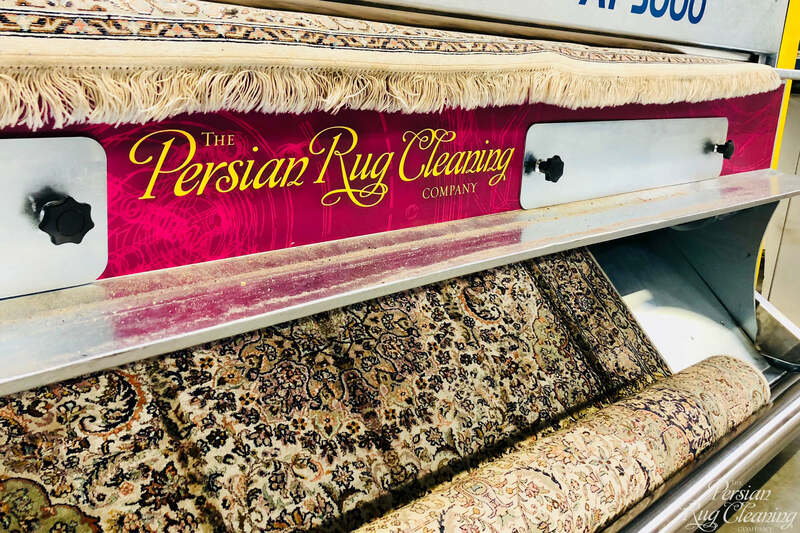 The key to ensuring that these challenges don’t turn into problems is by properly pre-inspecting every rug prior to cleaning to establish the safest and most thorough plan of action. Because of our passion for rug cleaning, we take the pre-inspection process far beyond the scope of what is just necessary. This is the only way to ensure we achieve the best possible results in the safest way we can. There is no ‘one process fits all’ solution in our industry because every rug cleaning which is carried out requires a balancing act between effectiveness and safety. We also use the pre-inspection to advise you if there are any pre-existing conditions in the rug, whether they are just natural features of the rug that you should be made aware of, such as white knots and abrash, or issues which will require specialist rug care treatments such as urine contamination and moth infestation. Any rug cleaner who skips this process is either complacent or arrogant. 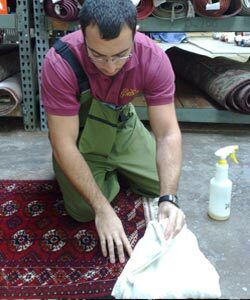 We dye test every rug that enters our facility. Dye bleed is one of the most common issues we encounter in a rug, usually caused by incorrect cleaning before the rug is given to us or urine contamination. Dye testing allows us to ascertain the best way to wash your rug so that the dyes do not migrate if they are unstable, or to tackle the project using a lower moisture system. pH testing enables us to effectively locate urine contamination. When utilised with a UV light we can take steps to neutralise the area in a targeted manner. pH testing is also useful for identifying rugs which have been left too alkaline by another company previously. This can pose a potential dye bleed issue which needs to be addressed prior to washing. Removing dry soil is the most important step we take to ensure that your rug leaves our facility both visibly clean and ‘truly clean, down to the foundation’. By the time your rug actually looks like it needs cleaning it will have collected a tremendous amount of abrasive soil which will act like sandpaper; slowly wearing down the soft natural wool or silk fibres as they are walked on. Removing this gritty soil is the key to prolonging the life of a rug. Failure to carry out this step will also lead to soil wicking up to the surface of the fibres during the drying step giving poor visual results. We guarantee that our dry soil removal procedures are the most thorough in the industry. To live up to this promise we utilise a range of different systems depending on the type and condition of the rug, often in combination; from mechanical beating to compressed air dusting. Essential – Over 75% of soil in a rug can be dry particulate matter. It MUST be removed prior to washing. This done either using a hand or a mechanical system. Effective – We use various systems to get the best results possible. Safe – None of the dry soil removal systems we use will damage your rug. Guaranteed – Bring us any rug cleaned by another company and we will guarantee to remove more dry soil. Kashmir rug belonging to a client in Holland Park W8, being fed through our mechanical dust beating machine. This is the most thorough system available to remove dry soil from rugs. This is the safest and most thorough way to clean rugs. We don’t rely on hot water and harsh chemicals, just cold softened water and mild pH shampoo. By fully immersing the rug in water we are able to completely remove and flush through all contaminants and soil using soft mechanical brushing, air rinsing and power rolling. We can also get the fringes beautifully clean. Thorough – Rugs are fully immersed in water. Safe – Water acts as a buffer which protects the fibres during cleaning. Woolsafe® – Only approved mild pH shampoos and cold water are used. Effective – All contaminants are emulsified, ready for rinsing. Think of this like the spin cycle your clothes go through in the washing machine. You wouldn’t skip this would you? Neither do we when it comes to cleaning rugs. We power rinse all the emulsified soil and contaminants out of your rug using cold water under high pressure. We then force the rinse water out using a centrifuge machine. Prevents rapid re-soiling – Forcing water through a rug at high pressure is the most effective way to remove emulsified soil. If this is left in the rug it will re-soil rapidly. Speeds up drying – The less water left in the rug after washing, the quicker it will dry. This is crucial. Read why below. Safe – Centrifuge rinsing is completely safe and won’t damage your rug. ‘Kashmir Silk’ rug in our centrifuge machine. This allows us to remove nearly all the rinse water from the rug. Quick drying is safe drying. This is because it minimises the risk of problems occurring such as dye bleed, shrinkage and browning. 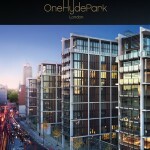 The high humidity in London makes controlled drying of rugs even more important. We utilise a temperature and humidity controlled drying room which allows us to force moisture out of the rug and pump it out of the building. This is coupled with the use of air movers. We can dry a thick Chinese or Bidjar rug overnight! Quick drying prevents dye bleed, browning, shrinkage and mould. We use heat and dehumidifiers to dry rugs fast. Increased air flow is used to speed up the drying process. Feel free to contact us if you have any specific questions relating to the rug cleaning process. Professional Rug Cleaning service offering full immersion washing of all types of natural rugs including wool and silk Persian carpets.